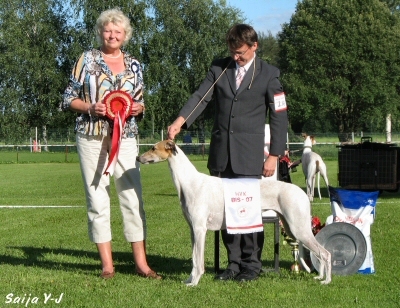 25.9.2007 Hertta's International Champion title has been confirmed by FCI! 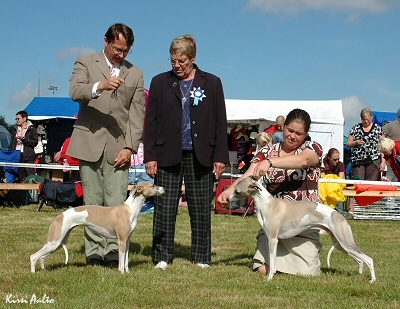 23.9.2007 Happy birthday Hertta & sisters Nuka, Hymy & Tsumba - 4 years! 21.9.2007 Happy 1-year-old birthday to Honey's kids Ada, Honda, Taikku, Tiku, Paavo, Petteri & Speedy! 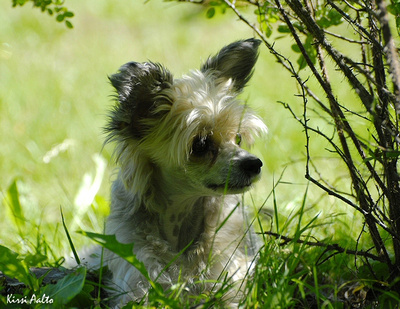 18.9.2007 Happy 1-year-old birthday to Hertta's kids Moja, Namu, Juuso, Nemo, Soni, Sisu & Sulo! 2.9.2007 Happy birthday Honey, Woody & siblings, 7 years today! Nero, Whiptails Winter Wish was 3rd with 221 + 237 = 458 points, sertificate quality. 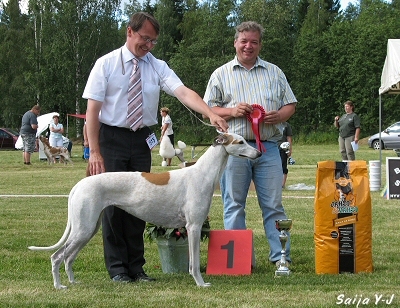 Nero was the best Finnish-bred Greyhound in this competition. Elli celebrates her 11th birthday today! 25.07.2007 Happy 2-year-old birthday Emil, Ida, Kille, Salttu & Wili! 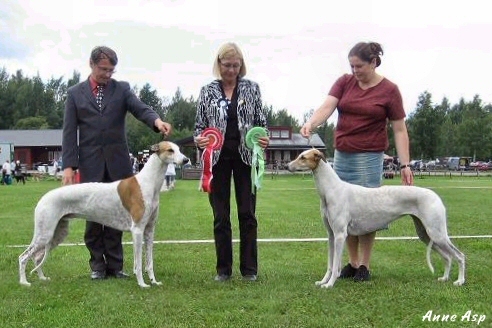 BIG-1 Int Ch Whiptails Lullaby Sky. Group 10 was judged by Matti Luoso. 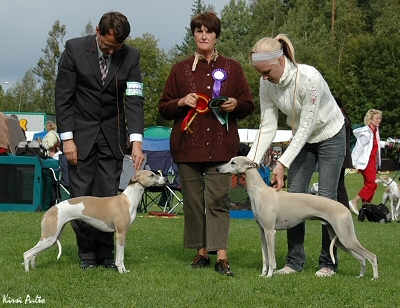 Greyhounds were judged by Karin Hedberg, Sweden. 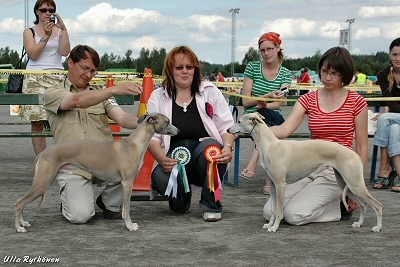 BIS- BOS-dog-competition was judged by Karin Hedberg, Sweden. 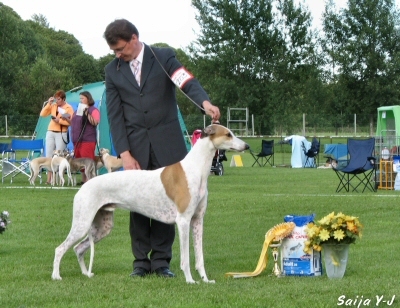 BIS-competition was judged by Bernard Barjot, France. 13.07.2007 Happy 4-year-birthday, Lily & siblings! 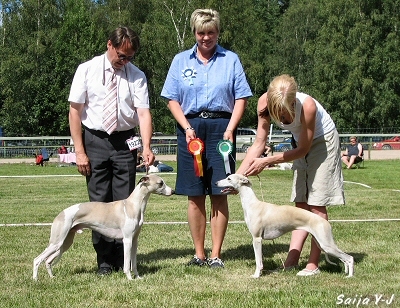 Salttu's daughter Razamanaz Guardian Angel was 2nd with price of honour in the puppy class.